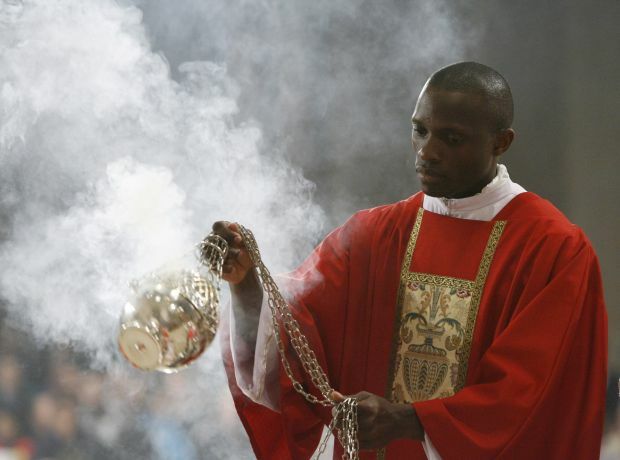 ALLENTOWN, Pa. (CNS) — Billowing clouds of incense at Mass and the inability to receive Communion can force some Catholics to cover their face or get out of the pew because of allergies and a sensitivity to wheat. Frankincense — the incense traditionally burned in religious ceremonies — can act on the brain to lower anxiety and diminish depression. It also can deeply affect people with respiratory problems and cause coughing fits and force them out of church to seek fresh air. Rather than doing away with censing, an ancient symbolic ritual used for purification and sanctification, Mercy Sister Janice Marie Johnson, coordinator of the Office for Ministries with Persons with Disabilities for the Allentown Diocese, said alternative incenses can be used. After researching the issue, she discovered a hypoallergenic incense called Trinity Brand at two local stores that sell religious items. An Internet search turned up church supply companies that sell it on their websites. “The scents are flowers, forest and powder. Powder is the lightest scent. This type of incense will accommodate those who are allergic to the present incense being used at liturgical celebrations,” said Sister Janice. The use of the hypoallergenic incense accommodates people who develop headaches or breathing problems during religious ceremonies when incense is used during the entrance procession and to incense the altar, the Gospel, the offerings and the priests and faithful. “Once parishes run out of their present supply, our hope is that they will consider purchasing the Trinity Brand hypoallergenic incense,” she told The A.D. Times, newspaper of the Diocese of Allentown. Parishes that decide to begin using the hypoallergenic brand are advised to place a sign in the vestibule or put a notice in the bulletin to alert parishioners of the change. Sister Janice also said Catholics who are gluten intolerant or suffer from celiac disease should be aware that many parishes are purchasing low-gluten altar bread to be consecrated. Celiac causes the body to attack the lining of the small intestine and other organs when certain proteins found in the cereal grains of wheat, rye, and barley are ingested. The autoimmune condition is estimated to affect one in 133 people in the nation. Father James Harper, assistant pastor of Notre Dame Parish in Bethlehem, said since canon law requires that altar bread used for Eucharist be made of wheat flour, the breads are not completely gluten-free. Parishes do take measures to keep the low-gluten and regular hosts in separate vessels to lower a person’s threat of an allergic reaction. Father Harper explained that Notre Dame keeps low-gluten hosts in a pyx, a sacred vessel used to take Communion to the sick outside Mass. And if a person’s gluten allergy is too significant to consume the low-gluten host, he said, other accommodations are made. “A person can alert the priests in the sacristy before Mass, and we can offer them the sacrament in the form of the most precious blood, which is wine,” said Father Harper. Since the number of celiac disease sufferers is increasing, Msgr. Victor Finelli, pastor of St. Francis of Assisi in Allentown, said most parishes offer low-gluten hosts, which are directly purchased from suppliers because of their short shelf life. “Most parishes are aware of their parishioners who requite low-gluten hosts,” he said. Connolly is on the staff of The A.D. Times, newspaper of the Diocese of Allentown.